Beloved tour guide, Dublin historian and author Shane Mac Thomais took his own life at Glasnevin cemetery on March 20 last year. Shane, 46, was the driving force behind the redevelopment of Glasnevin Cemetery and loved sharing knowledge. His death was likened to “a library burning down”. [Shane] was seen on CCTV entering the cemetery via a staff entrance…Garda Tara Dolan said he was seen walking towards the main part of the cemetery. “He then turns around, salutes to the camera and walks away,” she told the coroner. Gda Dolan said a number of letters to family and friends were found on Mr MacThomais’s person in the morgue. Coroner Dr Brian Farrell described these as “farewell” notes. Posted in Misc and tagged Shane Mac Thomais at 4:32 pm on June 25, 2015 by Broadsheet. Don’t worry. It seems the government are going to fix the suicide under austerity rate without spending a penny. There’s no suggestion that his death was linked to austerity. Fluffy didn’t link Shane Mac Thomais’ suicide to austerity. Maybe he didn’t. It doesn’t change Fluff’s point: there’s a trend. Says what really? Did he mention austerity in his suicide note? Fluffy, suicide rates have decreased year on year since 2001 and last figures for 2013 have been the lowest in some time? @Wayne perhaps but how many are not reported? If Waynes point about suicide rates declining are true, then why would the unreported number matter? Presumably the percentage of deaths that were suicides but not reported as such would remain the same. I remember there was a great documentry on the TV about Glasnevin cemetry and Shane was the main man they interviewed. He gave the tour guides around the cemetry and i remember saying id love to go on the tour and from watching the clips on the TV you could see that he was brilliant at what he did and had a wealth of knowledge. Absolute tragedy that he is gone. At the end of the documentry it said he was found dead in the cemetry one morning…………….i was deeply saddend by this and couldnt believe it. After watching the programme and getting excited about visiting the place and hearing him tell all the stories about Glasnevin cemetry and the way he interacted with the people on the tour was amazing. Very sad that he left in this way. RIP Shane. That was a fantastic documentary. Really well made and he came across as such a nice man. All the way through I was thinking a visit to the cemetery would be really interesting. Couldn’t believe it when they showed the bit at the end, such a shock, and such a waste. Very sad. RIP Shane Mac Thomais. One Million Dubliners – A magnificent film that will haunt minds for centuries to come. I never met Shane Mac Thomais but I feel I knew him well enough from the film to call him a friend. Presumptuous, yes, but if you watch the film you may understand what I mean. Shane was a gentleman of the highest caliber and our world has fallen slightly dimmer in his absence. Rest in peace Shane Mac Thomais. Shane was a genuinely lovely guy. Stood out for his intelligence, wit, honesty, but I don’t think anyone who knew him would say it came as a massive surprise. Not sure why but all the people I know who have committed suicide were particularly pleasant, gentle and kind people. Because the world we live in isn’t gentle and kind in return? + way too many. Rest in peace Sir. A huge loss. 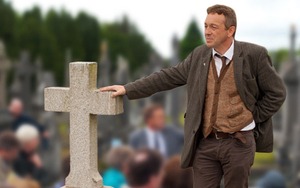 Same as others above, I saw One Million Dubliners in the cinema and during the film I thought, I can’t wait to visit Glasnevin and meet this guy. Had never heard of him two hours beforehand, but when I saw he had passed away, I was cut up. RIP fella. He was a great tour guide and historian. had no idea he had passed, Is really sad. RIP. I am shocked. I didn’t know he left us. Didn’t know him personally, but seen his brilliant character a couple of times on TV, and each time thought to myself, why aren’t there more people around like him. He was so warm and engaging. I’m sad to hear this. Dublin is a lesser place without him, I’m sure. I was privileged to know Shane for a short time, he was an absolute gent and a gifted intellectual with a wicked sense of humour. As well as bringing joy to the many faces that came to hear his distinctive repertoire in the cemetery, he also helped those that were in need of support – he had a lot of time for other people, the world needs more guys like our Shane. You sound like a right bota. Sorry, sorry, not a good thread to be trolling on..
You can’t help it, you’re probably a Dub..
Isn’t it strange that we don’t hear much about men of substance like Shane in the meeja but we have eejits like Gerald Keane or some dubious entrepreneur or other staring out at us whenever we open a newspaper. Lilly people’s priorities are gone mad. Would you like if Gerald Keane committed suicide, Lilly? Of course not Peter. Don’t insist on being an idiot and deliberately twisting my point. But you don’t like entrepreneurs? Oh no doubt turning a buck can be a noble calling but historians and intellectuals tend to be livelier dinner companions. And they don’t pepper their speech with ‘going forwards’ making my ears bleed. PS I don’t want entrepreneurs to commit suicide either, just so we’re clear. I suppose it’d be bad form to say yeah, would it? His mother would be unhappy if she’s still alive and his kids if he had any. But to compare Gerald Keane with a scholar and a gentleman like Shane is trolling of the lowest order. Nobody is comparing Shane with Gerald Keane. Jeez is English your fifth language? Read what was written. He’s the patron saint of the Sunday Indo. Wonderful lad, a terrible loss. RIP a chara. Raising a glass to you. For those of you who the film prompted to want to visit Glasnevin, do visit if you have not done so. Shane started something wonderful and it has continued on in the spirit and tone he set. I have been a few times with different visitors and the guides have been great. The trust receives no government money and uses the revenue from visitors among other things to renovate the older graves where there is no family left to do so and are rebuilding the staircase in O’Connells monument. And you can pop around to the Gravediggers afterwards as a little bonus! Agreed, I did the tour a couple of months after Shane Mac Thomais died (my wife had done his tour a couple of times and loved it, so we knew who he was and how he died), and it was fantastic. Got to have a great chat with the guide about the militant Republicans who visit the graves of the revoluitionary heroes buiried there, and found a pamphlet on Kilmanham Gaol with some stuff about my great-grandfather (he was a veteran of the 1916 rising and was one of the people who retored the Gaol) in it in the gift shop! My sis did the tour as well (not with Shane AFAIK) and said it was fantastic.